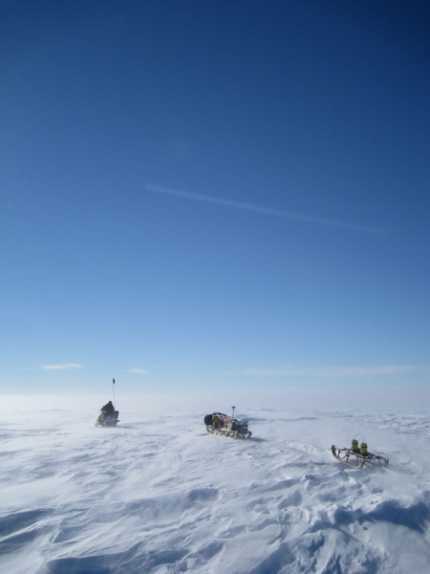 British scientists have found a remote ice rift valley, up to one mile deep, under the ice in Antarctica. The hidden valley below Ferrigno Ice Stream in West Antarctica is contributing to the area's dramatic ice loss and could provide more clues to the effect global warming has on sea level rises. The area is so isolated that it has only been visited one time previously in 1961. The ancient rift basin, filled with ice, is linked to the warming oceanthat has an effect on ice flow, according to the report in Nature this week. Scientists from Aberdeen University and the British Antarctic Survey carried out the research. Glaciologist and lead author, Dr Robert Bingham says, "Over the last 20 years we have used satellites to monitor ice losses from Antarctica, and we have witnessed consistent and substantial ice losses from around much of its coastline. The ice sheet in West Antarctic is losing ice at a faster rate than any other part of the continent and some glaciers are receding annually by over one metre. Scientists believe that by understanding more about the ice loss here, they can make more accurate predications about how global warming will affect ice melt and sea levels in future. West Antarctica's thinning ice adds almost 10% to global rises in sea levels. Dr Bingham, who works at the School of Geosciences at the University of Aberdeen, found the valley while carrying out fieldwork for the British Antarctic Survey two years ago. They discovered a huge ice-filled valley, a mile deep in some places - as significant as the Grand Canyon in size. Without the radar, they would not have realised it was there, as the scenery is flat. The findings from the valley correlate with other records and satellite data of ice loss, Dr Bingham says. Geophysicist and fellow author Dr Fausto Ferraccioli, from the British Antarctic Survey, says up the Ferrigno Rift is part of a massive rift system that is little understood. The research demonstrates that the rift basin can influence ice flow today and may increase the loss of ice by causing changes to the coast more inland. The ice sheet, up to 4km thick, covers bedrock in Antarctica or Greenland. It flows from the centre of the continent out to the coast, and then is fed into ice shelves. The study is part of the British Antarctic Survey's Icesheets Programme that investigates how ice sheets change and what effect they have on the rest of the earth, including rises in sea levels. Britain's Natural Environment Research Council financed the fieldwork. Above: A narrated animation showing that the current pattern of ice thinning observed in West Antarctica is inherently influenced by geological processes over millions of years.